Countless traders have no idea how much profit they can acquire from cashback and rebate, while this service is available without any commission or fee. Subscribe our newsletter And receive the latest news, analysis & exclusive offers. Risk Warning: Trading in Foreign Exchange (Forex), Binary Options, Options, Commodity Futures, Options CFD'S and Spread Betting has considerable potential reward, on the other hand has substantial risk. The high degree of leverage associated with trading Forex, Binary Options, Options, Commodity Futures, Options, CFD'S and Spread Betting can work against you as well as for you. You MUST be aware of the risks in trading and investing into Forex, Binary Options, Options, Commodity Futures, Options CFD'S and Spread Betting and you MUST cogitate whether trading is suitable for you considering your financial condition. Kindly do NOT trade with borrowed money or money that you cannot afford to lose. PForex.com does NOT offer or solicit to buy or sell currencies, futures or options. Trading especially on margins that involves high risks is not suitable for all investors. Due to high potential risks of investing and trading in financial markets, you as visitor, client, trader or investor MUST be informed of such high risks and accept all responsibility for financial loss, lost profits, any special incidental or consequential damage, any other loss or injury as a result of direct or indirect use of any content on PForex.com by you, any third party or anyone else. Previous performance and results do NOT guarantee future prosperity. All analyses, trading signals, financial information, prices and quotes, reviews, news and inquiry on PForex websites are general comments but NOT as advice or financial direction. Disclaimer: Any contents provided by PForex LLC do NOT constitute or represent investment advice. PForex LLC and its directors, employees, officers, affiliates or associates are NOT liable for any kind of financial loss, lost profits, any special incidental or consequential damage, any other loss or injury as a result of direct or indirect use of, including but not limited to, Trading Signals and Technical Analysis, News, Quotes, Charts and Prices, Brokers Information and Reviews, Educational Materials and all other contents provided by PForex LLC via website or Apps by you, any third party or anyone else. 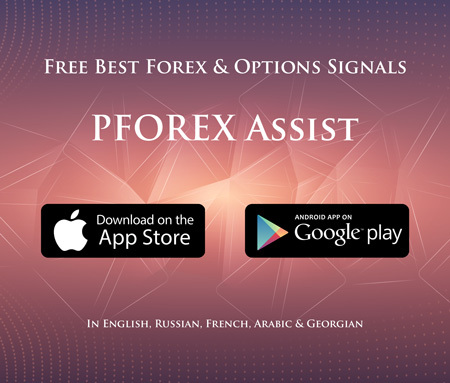 PForex LLC does NOT warrant and guarantee the suitability, reliability, availability, merchantability, timeliness and accuracy of any content represented through PForex.com and Apps. All provided market data and prices are not necessarily real-time nor accurate. The Forex and CFDs prices are not guaranteed to be accurate and real-time by PForex so the prices may differ from actual market price. The prices are not represented for trading purposes so PForex is NOT liable for any kind of financial loss, lost profits, any special incidental or consequential damage, any other loss or injury as a result of using provided prices. The information, products, services, related graphics and software on PForex.com are provided "AS IS" without warranty and guarantee due to inaccuracies, omissions and lags. The past performance of any trading method or system is not necessarily indicative of future issue and result. The demonstration of profit and loss of any account discussed on PForex.com does NOT imply that any other account is likely to achieve the similar profit or loss. PFOREX.COM does not provide CashBack/Rebate services to US residence.